I went down to the garden to take some pictures and found these little guys all over the place. I had no idea they were eating all my plants! 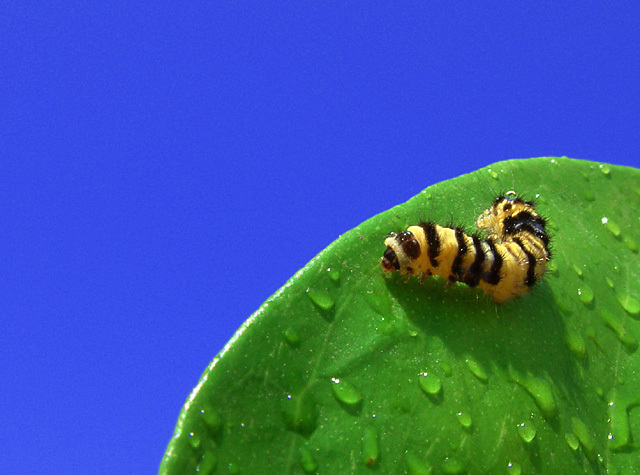 Anyhow, I shot this little guy on a citrus leaf against the blue sky. I sprayed the leaf with a squirt bottle just to make it a little more interesting. I then increased saturation and adjusted the greens and blues hues to darken the sky and make the leaf look more vibrant. Excellent colors and sharpness. Fun shot! Nice job - congratulations. Great finish for your first entry. Nice sharp colors and contrast. Great capture. Great shot with beautiful contrasts and details. You´rs the best IMO. I rated this a 9. Top 3 for sure-- great shot! I like this shot, very simple, yet very interesting. Very good details and color..
the contrast in the colours works well for this shot. And we have a winner. This shot has it all. Super composition. Great color. Sharp focus. A 10. Perfect macro. Everything works together here - 10. I *love* the colors. Wow. fantastic colours - a chomp out of the leaf would have matched the title more - but it's a 10 for me anyway. nice! i love the graphic feel and colors. very clean and simple. I saw one too many bugs in this contest. But this is by far the best. The color of the sky against the green leaf, the water drops, and the little buggy are all excellent. Whow - highly impressive! Your composition (and the choice of colors) works simply great here. Good luck for the challenge! Excellent primary colours (though the blue seems a little too rich) and good composition. Reminiscent of Jacko's "Round and Round" entry. I like this a lot. Proudly hosted by Sargasso Networks. Current Server Time: 04/19/2019 10:15:41 PM EDT.